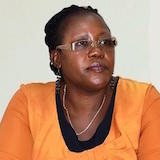 Josephine Ahikire is Dean of the School of Women and Gender Studies and an Associate Professor of Gender Studies at Makerere University, and is Executive Chair of the Centre for Basic Research (CBR), a leading research centre in Kampala. Josephine has worked extensively in feminist political theory and has published works on women and politics, labour and urban culture. She is an active member of the Uganda Women’s Movement and is also member of regional bodies such as the Council for Development of Social Science Research in Africa (CODESRIA) and the African Gender Institute (AGI) University of Cape Town.